We love to read anthologies because they offer readers a sample of a writer's style of storytelling. Many times we have found out about authors simply from reading an anthology. This Sunday we host a very special tour. 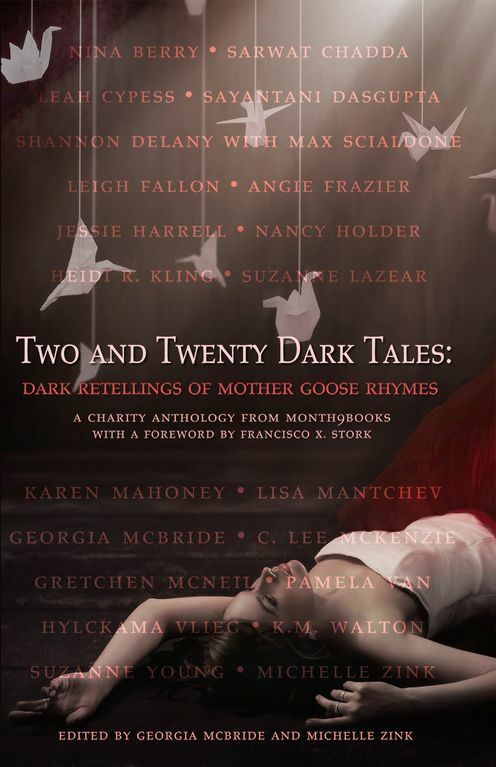 Two and Twenty Dark Tales: Dark Retellings of Mother Goose Rhymes is the very first book published by Month9Books and it is an anthology featuring many of the top writers in the Young Adult genre today. Read on to discover all about this company and the collection. We have a guest post written by author C. Lee McKenzie as well as a giveaway. Thanks for stopping by! TWO AND TWENTY DARK TALES: DARK RETELLINGS OF MOTHER GOOSE RHYMES. THIS AIN’T YOUR TODDLER’S MOTHER GOOSE BOOK! Month9Books, a new publisher of speculative fiction for teens and tweens launches in October 2012, with the release of TWO AND TWENTY DARK TALES: DARK RETELLINGS OF MOTHER GOOSE RHYMES. This unique collaboration’s proceeds (from the first 5,000 copies sold) will be donated to YALITCHAT.ORG, an organization that fosters the advancement, reading, writing and acceptance of young adult literature worldwide. Michelle Zink, Lisa Mantchev, Sarwat Chadda, Nina Berry, Leigh Fallon, Suzanne Young, C. Lee McKenzie, Angie Frazier, Jessie Harrell, Gretchen McNeil, KM Walton, Heidi R. Kling, Nancy Holder, Karen Mahoney, Suzanne Lazear, Pamela van Hylckama Vlieg, Shannon Delany with Max Scialdone, Leah Cypess, Sayantani DasGupta, and Georgia McBride, founder of Month9Books. Francisco X. Stork, author of the critically acclaimed MARCELLO IN THE REAL WORLD, provides a foreword that is nearly as riveting as the stories themselves. When asked why they wanted to be a part of TWO AND TWENTY DARK TALES: DARK RETELLINGS of MOTHER GOOSE RHYMES, the authors had a lot to say! Someone at a book signing recently asked me where I came up with the stories I’ve written and what my process was for getting those stories out of my head and onto the page. The short answer would have been, “Don’t ask me.” But I’m not into short answers, so I gave the question some thought and here’s what I’ve come up with. Stories come like clouds, usually when I least expect them and usually when I’m attending to other things, like brushing burrs out of my cat’s fur. Some of these clouds are dark and filled with the promise of a storm; others are those lovely white ones that come in spring and mist the air before scudding out of sight. Some look like mythological creatures or rabbits or faces that shift expressions while I watch. Once a cloud has settled in my brain it pretty much stays there until I do something about it. The problem is it stays day and night, mostly night, so when I’m trying to sleep it’s shifting around in my brain, storming or misting or behaving like a unicorn or a satyr. Then my bed starts to fill with characters. They talk to me and to each other. Locations like cities or forests or horse ranches pop up like movie sets and suddenly those characters are in a place, their place, the one they expect me to create on a page, so they’ll be able to have somewhere to live. Then the question of “What’s this story about?” starts nagging at me. Who are these people yammering at me and what do they want or need? I usually wrestle that down in a one or two sentence premise. Once I have that I can start entering the words into a file. I do almost all of my writing on my computer, but during the early “wrestling” stages I’ll make notes on just about anything, including the back of my hand--really. The rest of the process is daily grind or euphoria, depending on how the writing goes. I look forward to plowing through to the end, so I can start the real delving and expanding. Rewriting is my all time favorite job, and I’m not being sarcastic. I have the main thread woven from beginning to end; next it’s all about embroidery and texture. It’s at this stage I really feel free from the mechanics of where, when, how, and why. I don’t know if that makes sense, but this is the closest I can come to explaining how I feel. While this topic is one that keeps coming up, I don’t think readers or writers tire of hearing about the creative “process.” Each writer is unique and that’s what makes books the treasures they are. We can enter their world, look at life from a different perspective, and learn or enjoy so much every time we turn a page. I love to hear how other writers “find” their stories and what their process is, so if you’re one of those writer types, please share. Thanks for this opportunity to appear on Reader Girls. It’s been great to be here. 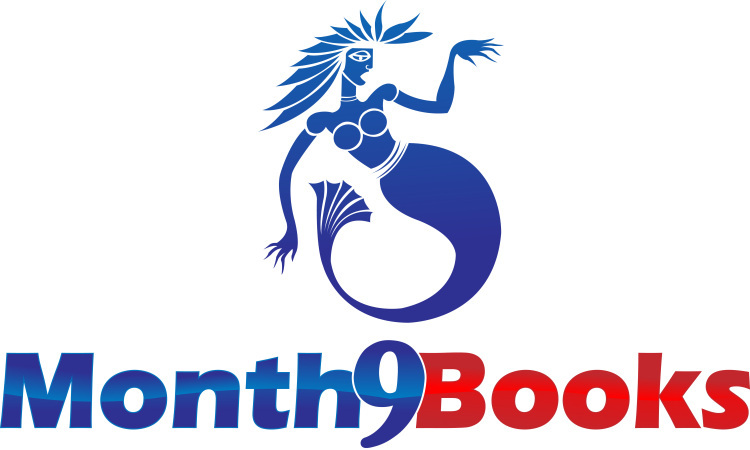 Month 9 Books is a publisher of speculative fiction for teens and tweens… where nothing is as it seems. Month9Books will donate proceeds from each of its annual charity anthologies to a deserving charity. Individually, authors may donate his or her advances and royalties to a charitable organization. Month9Books will also release 10-12 non-charitable titles annually. TWO AND TWENTY DARK TALES: DARK RETELLINGS OF MOTHER GOOSE RHYMES is Month9Books’s first release. Month9Books is distributed by Small Press United, a division of IPG. You may visit www.month9books.com for more information. Alligators, witches and a spooky mansion aren't your average neighbors . . . unless you live at the edge of the Ornofree swamp in the backwater town of Hadleyville. The town’s bad boy, Pete Riley, may only be twelve, but he’s up to his eyeballs in big trouble, and this time he isn’t the cause. This time the trouble arrives when a legendary hundred-year-old mansion, materializes next door and the Ornofree alligators declare war to save their swamp from bulldozers. Things only get worse when Pete’s guardian aunt and several of her close friends vanish while trying to restore order using outdated witchcraft. Now Pete must find his aunt and stop the war. He might stand a chance if his one friend, Weasel, sticks with him, but even then, they may not have what it takes. 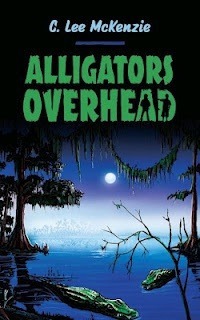 Thanks to Month9Books we are able to giveaway one ecopy of C. Lee McKenzie's ALLIGATORS OVERHEAD to one reader. This giveaway is open Internationally and ends on midnight, November 17. I thought this was a really great collection (based on the e-ARC I reviewed). There were a lot of different writing styles and I think this is one well-worth reading. I am pretty sure I am following you with GFC, but something has changed and I am not sure. I could not find a way to do so or confirm this. Have signed up with facebook and hope to keep in touch :) Thank you for this awesome post, it was a fun read. Intriguing post, The concept of this book sounds pretty appealing to me, though I'm not so sure I'd pick it up at a bookstore.